Bird's the Word This Weekend! This photo was taken Friday at the Chicago Botanic Garden. 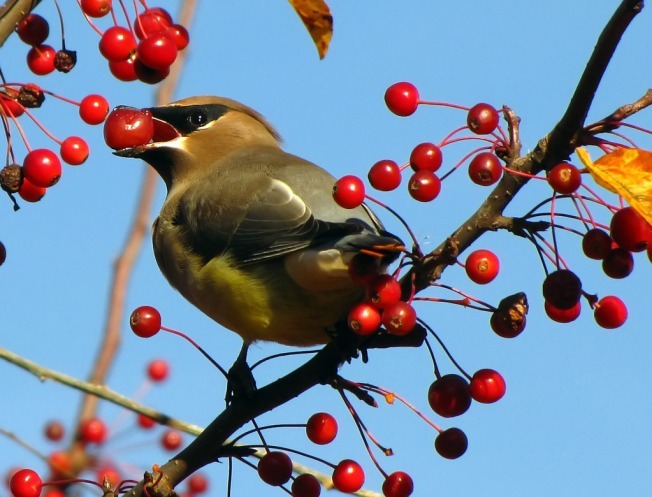 The bird is a Cedar Waxwing. Franz Perfect Fishboat@comcast.net Description: purple-fish "Tight Lines!" This weekend, take part in a nationwide event that celebrates your feathered friends. The annual Great Backyard Bird Count is going on until Monday. It's a joint project of Cornell University and the Audubon Society. You don't have to be an expert to take part. Just head out to your backyard ot any other outdoor setting and observe the birds around you. Then head over to the Great Backyard Bird Count website and follow the instructions for entering the number you saw. This event is not only fun, but it's got another purpose this year. Organizers say this year's count could show whether birds along the Gulf Coast are still feeling the effects of last April's BP oil spill. To find out what birds live around you, head over to the Great Backyard Bird Count website.